This fight is going to have some major consequences in the SV universe. Does that mean life-changing events, or life-ending events? You’ll find out very soon. Let’s look at a new Comic of the Week. 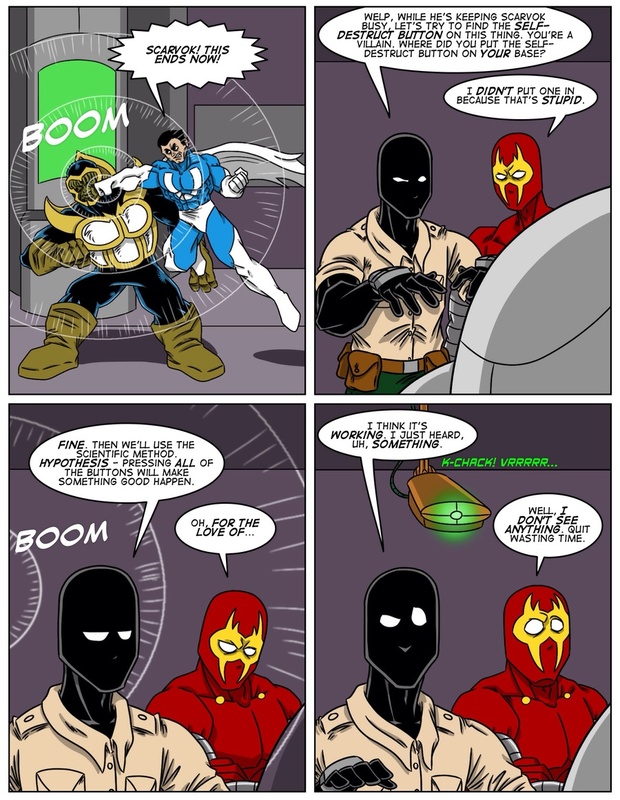 Cosmic Dash is an ensemble cast science fiction comic in a deeply developed universe of its own. It’s lighter in tone, with terrific art. It’s worth a look. You can leave comments by clicking here, leave a trackback at http://supervillainous.spiderforest.com/comic/button-mashing/trackback/ or subscibe to the RSS Comments Feed for this post. Yeah, that’s about me with computers too. Great. Claw settled for basic common sense and the aliens read the Evil Overlord list. I wonder how durable the Actioneer is; can’t dodge everything. Of course, it might make Claw MORE powerful! I hope.